I had my first ever acupuncture session when I was in the middle of mercury detox. I really had no idea what to expect. Needles? Pain? Nothing at all, because the whole thing sounded so made-up and hokey? But it turned out that I loved acupuncture! I lay down on the table, and the acupuncturist inserted a dozen or so needles with surprisingly little pain. She left the room to let the treatment take, and I drifted off into a cloud of what I can only describe as bliss. After the acupuncturist returned and removed the needles, I had a hard time focusing on getting into my clothes and out the door because I kept pausing to think about how happy I was and having a little giggle. Who knew acupuncture could be so fun! My next sessions weren’t so dramatically blissful, but they were all colored with the same lovely feeling that permeates all of my encounters with Traditional Chinese Medicine: an end of pain and a return to balance. Traditional Chinese Medicine doesn’t make much sense to my Western, logical brain. I find it hard to take seriously. Sickness being caused by an attack of windy damp? Constipation being relieved by pressing on a point on the back of my hand? It sounds kind of crazy. But when I put all that to one side and examine the results, the fact is that it actually works. This was made crystal clear to me in the middle of my detox journey. I woke up one morning and something had happened to my back. I was in a point during chelation where I had a lot of mystery cramps and spasms, but it had never been this bad. I was in such pain that I couldn’t get out of bed. I knew that I could probably do some research and find minerals and supplements that would eventually ease my pain, but I wanted it to stop now! I called my acupuncturist and made an emergency appointment, and my girlfriend helped me out of bed and into the car. I was so miserable hobbling into the clinic and onto the table. It was hard to believe that something as insubstantial as a few slender needles could make a difference. And yet, and hour later, I hopped down from the treatment table completely pain-free. It was amazing. I felt light and balanced, and a bit blissed-out around the edges, and the pain didn’t return for a long, long time. 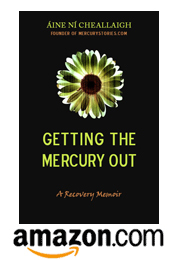 As you manage your mercury symptoms, especially if they involve any kind of pain, I definitely recommend looking into acupuncture as a treatment option. Sessions can be expensive, but many health insurance plans offer some coverage. And if you live near an acupuncture training school, they often offer low-cost treatment in their clinics. The great thing about acupuncture is that you can enjoy many of the benefits of it at home by applying pressure with your fingers to acupuncture treatment points. An excellent guide to this is the book Acupressure’s Potent Points by Michael Reed Gach. It’s a book I refer to all the time to do mini-acupressure sessions on myself to relieve little aches and pains, and enjoy a taste of that acupuncture bliss. ← Awesome Supplements — Introducing Magnesium!